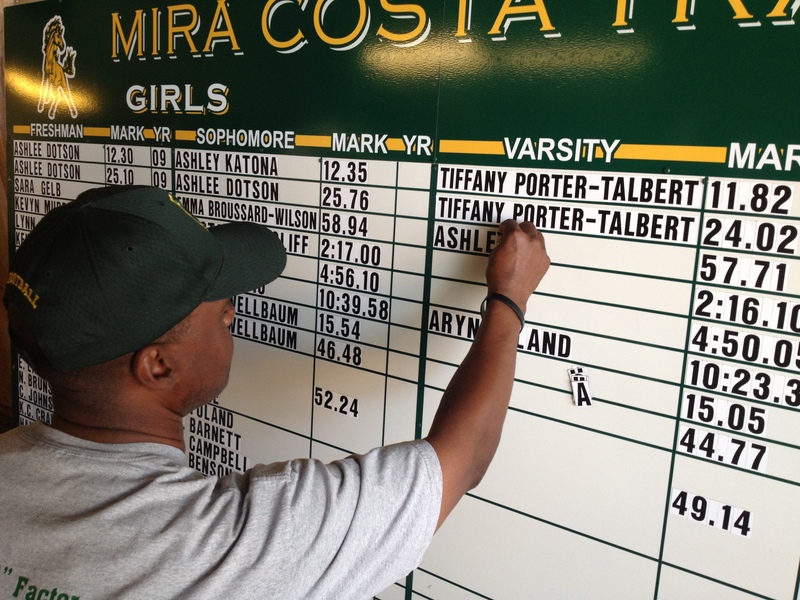 The MCHS Track & Field Record Wall! 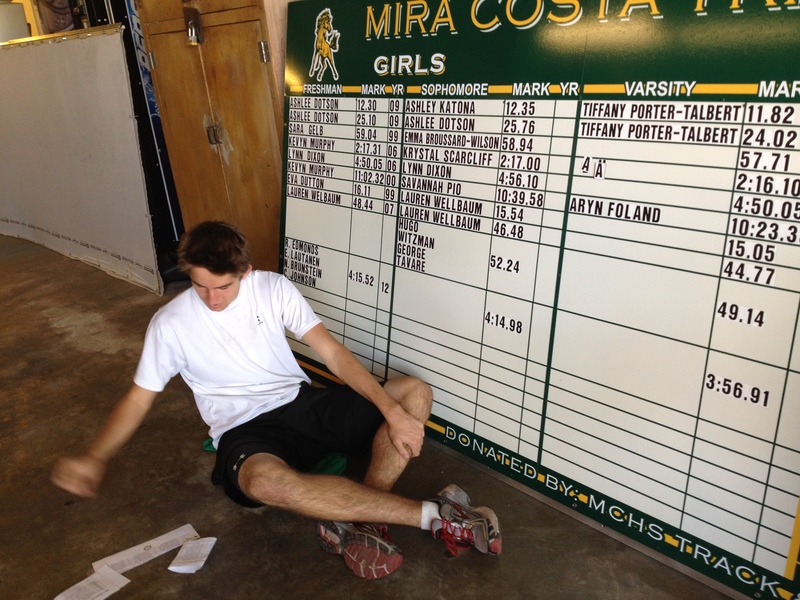 We are very excited to announce that our wonderful MCHS Maintenance Crew, led by Jeff Mullikin, installed the new Track & Field Record Board earlier this week! Although the process wasn’t quite as involved as getting the Space Shuttle down to the Science Center, let’s just say, there were plenty of logistics to navigate! So many folks to thank: First of all, to Coach Robert Calderon and Coach Moe Russell for getting the process started way back in June; to all who have donated to T&F faithfully over the years to fund this project; and to our current Board who green-lighted the project and guided it through the four-month process! Advanced Record Boards of Michigan created this beautiful project, and we are very appreciative of their help in getting it just right. Time consuming work – but worth it! 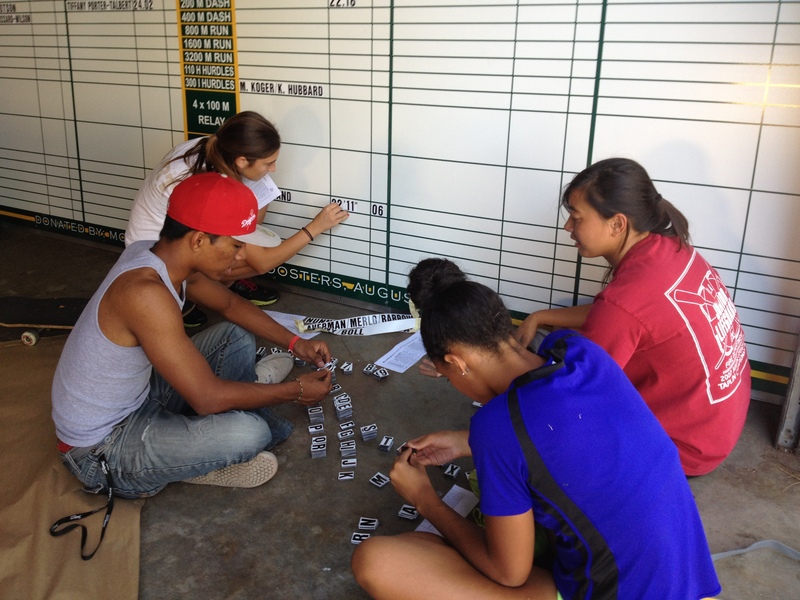 Thanks also to Coach Moe for supplying us with a great crew of athletes last Friday to put the records on, one letter and number at a time — Trinity Goss, Robert McMahon, Nicole Oster, Cynthia Pham and Americo Sam — thanks for your precision work! Coach Moe said he hopes to have to update many, many records at the end of the upcoming season — hear that Mustangs? He’s thrown down the gauntlet….make him climb the ladder and put on those new names and numbers! 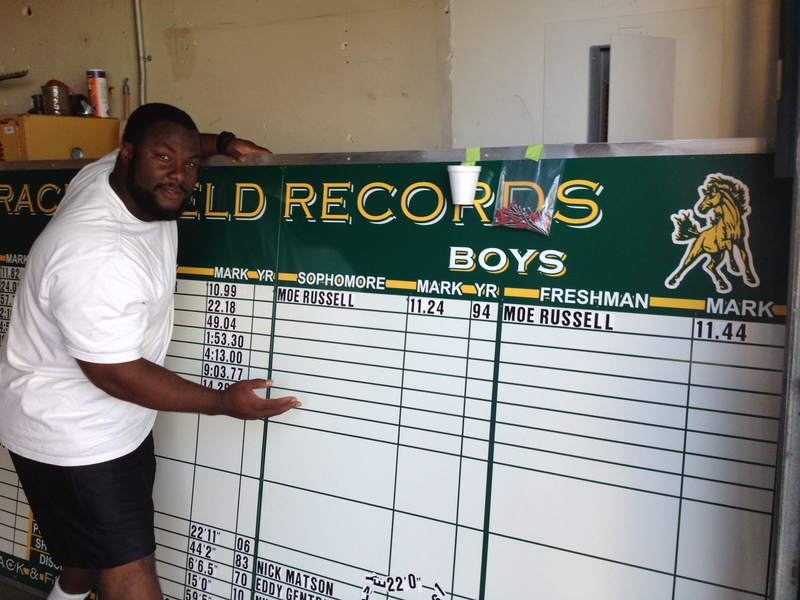 We encouraged Coach Moe to place his own name and records on the wall (before it was installed) — a great privilege! Robert McMahon placed his brother, Joe’s name on a relay record (and said he hopes to be able to put another McMahon up there before he leaves Costa) and Arnold Dotson, who helps out with Football, was able to stop by and place one of his daughter, Ashlee’s, records. It was just a family affair! Arnold Dotson places daughter Ashlee’s record — one of them, anyway! Coach Moe to 2013 Sprinters: Break my records! Have a great weekend, Mustangs!